My husband Matt made this trunk in shop class in high school. As you can see below, it was made out of knotty pine. I have always loved it…it’s very sturdy, and has a lot of storage space inside…plus, Matt made it. As much as I loved the trunk in its original form, it just didn’t fit in with our home’s decor. I have been begging him to let me paint it for years, and last week, he finally gave in!!! Now it lives in our family room, and we love, love, love it! 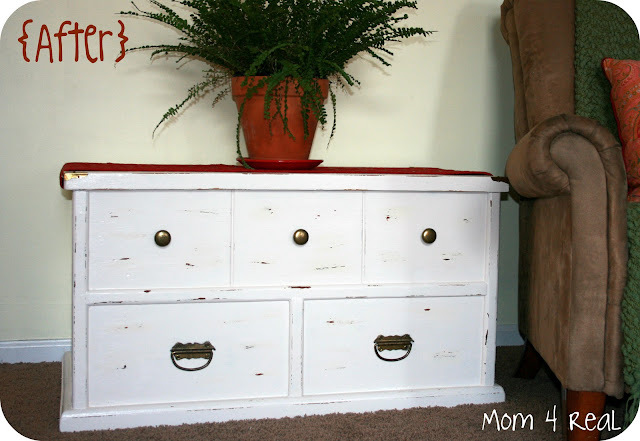 I love to give old furniture new life, and it is so super easy. I just lightly sanded the entire trunk, then primed it. I then painted it…it took 2 coats to look exactly the way I wanted. Finally, I took some sand paper and distressed it a little. I didn’t mess with the hardware, because some of the screws were stripped, and I didn’t want to take the chance of damaging the wood around it. I hope this sweet little trunk inspires you to drag in an unwanted piece of furniture from your garage or attic and give it new life! Jessica, Thanks so much for linking at Sunday’s Best, I noticed your picture on your link didn’t work. If you want please resubmit to everyone can see your lovely trunk, and I will delete the first one. …and the original hardware still worked for the new look. Fantastic job! It looks great! I want one in my house :) New Follower! You can visit me at http://raisingdieter.blogspot.com/ THanks! So cute – looks great! I have a trunk that needs a makeover too. Thanks for the inspiration! I’m surprised he let you paint it. 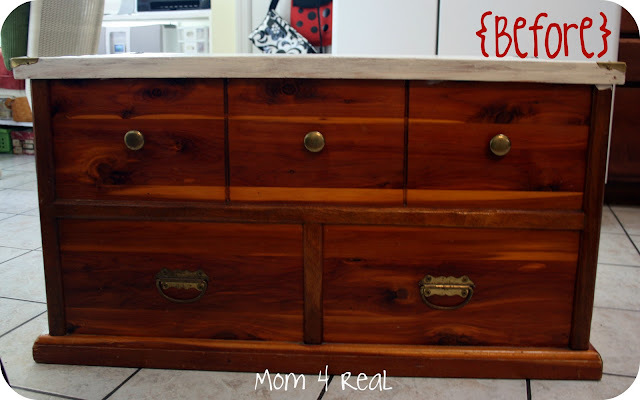 I didn’t think men liked painted wood – or at least that is what my husband tells me! It looks great! first it looks great redone like this, and second, i’m so glad you decided to do that, so you can keep your hubby’s piece! I WANT THIS PAINTED DISTRESSED CHEST. You did a really great job! Thanks for giving me some inspiration. Thanks for sharing with us at Sunday’s Best. What a nice husband you have! I keep asking mine if I can paint our coffee table and it’s a big fat NO. Someday, he’ll cave. I’m pretty annoying. :) I love the white, distressed look! Does hubs like it , too? Great job! Oh wow–I love the update! The trunk looks amazing. I love it’s new look. Awesome!! I love how this turned out! How cool that your husband made it. I can see why you want to keep it! what a difference your paint job made! fyi…just featured your great post this week! C’mon back tomorrow for the next NORTHERN COTTAGE PARTY TIME TUESDAY! That is a great makeover! Looks really good now! I’d love for you to link it up at Tell it to Me Tuesday’s link party. It really updated that beautiful piece! I would have kept the original hardware too. perfect perfect perfect! Thank you so much for sharing…. I am drooling!!! !